It's a rainy, grey day here in Ontario and I wanted to add some pick me up colour to the house. 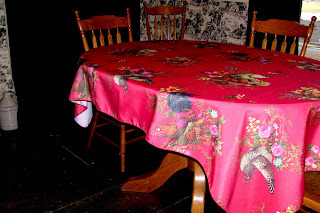 Then I remembered it irritates me because mass produced tablecloths are skimpy on fabric. The drop on the cloth should be 8 to 12 ". I have a painter's drop cloth and I'll do just about anything to put off prepping my kitchen cupboards for painting! I'm not a sewer. I'm more of a figure out how something was made and copy it my own way, kind of girl. So, you know this will be simple to make. I buy the lighter drop cloths so they are more flexible to work with. They shrink like crazy, so be sure to wash them and throw them in the dryer before you sew. I've used the pre-hemmed parts of the drop cloth so there is no sewing there. 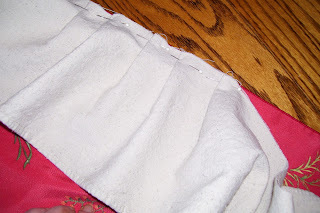 I did have to join ruffle sections to get enough length but that is just a straight line, so no big deal. 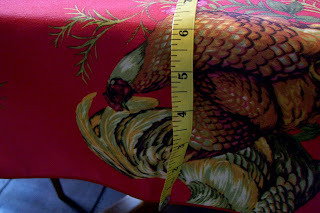 Then, it's a simple line of stitching all the way along the tablecloth. That gives me time to figure out how to get out of working on the kitchen reno tomorrow! Great look for your table cloth! 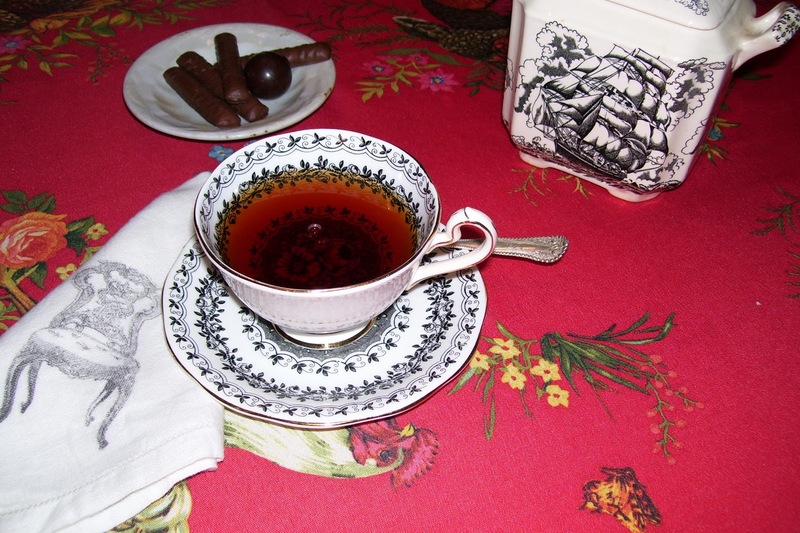 And, by the way, love, love, love your tea cup and pot! Tea is good any time! 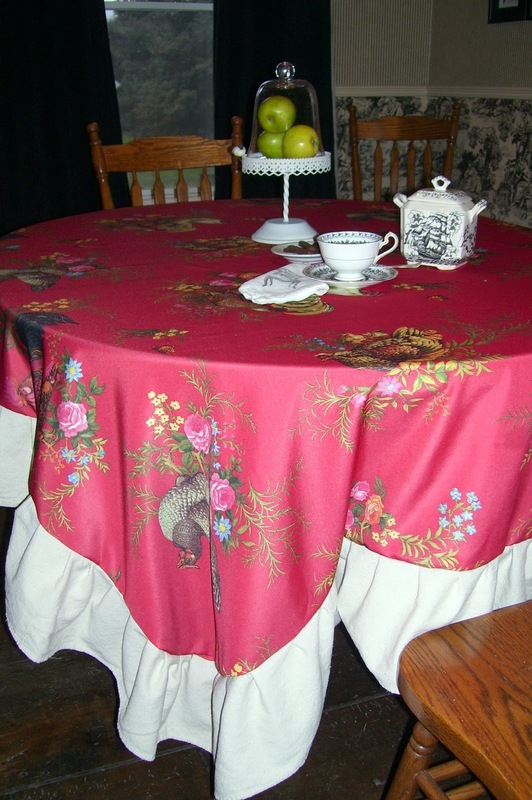 That ruffle turned out very nicely, and it holds the table cloth in place with the added weight. Great idea. Great idea and so simple even I could do it, just! off to take a look at Courtney's blog now. Happy Pink Saturday and thanks for stopping by earlier. You are so clever! 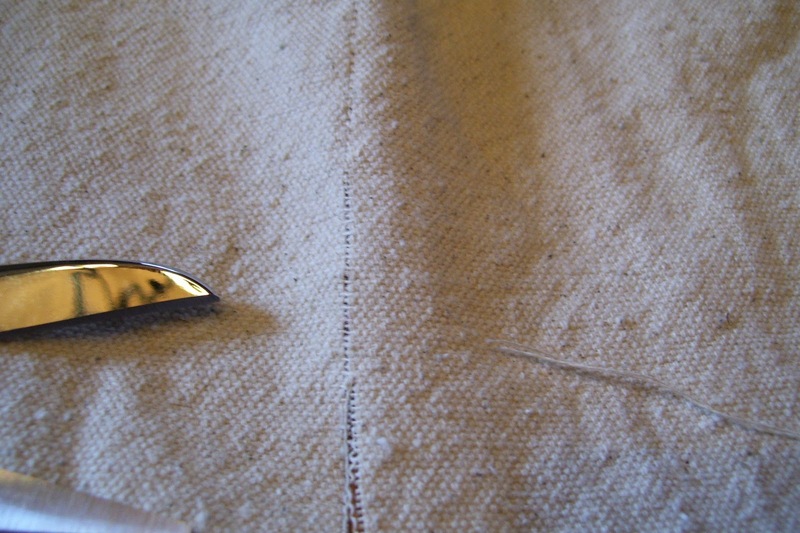 And I love the tip on pulling the thread for cutting a straight line. Must remember that! Wow! 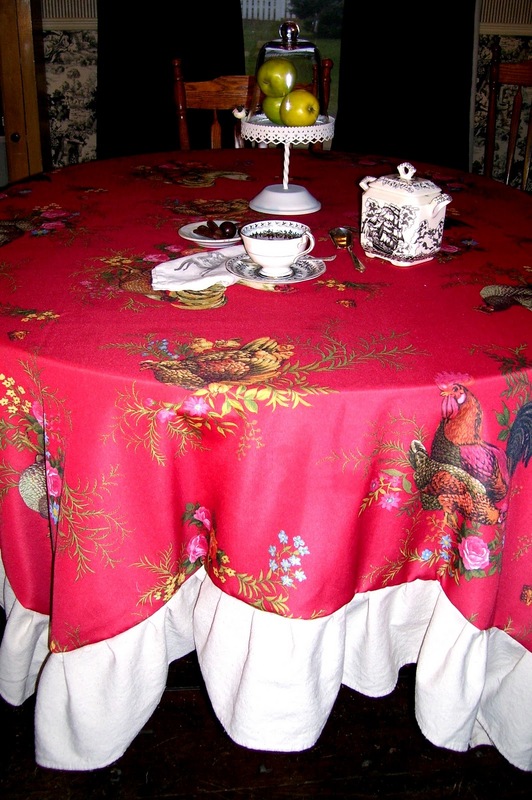 The table cloth looks gorgeous. Now I know why some of my tablecloths look so...lacking. Thanks for the guidelines and the ruffle idea. Also, thanks for visiting my blog and commenting. I had to laugh at your attitude about when it's time to sell, your daughters can hire a stager! That's how I am feeling, too. I'm your newest follower, and enjoying reading about your clever projects. Maureen you are so clever! That really gives a sense of fun to that tablecloth. I love it! Maureen that is awesome. My Mom is going to be teaching me to sew soon. It has been on my bucket list for some time!!! 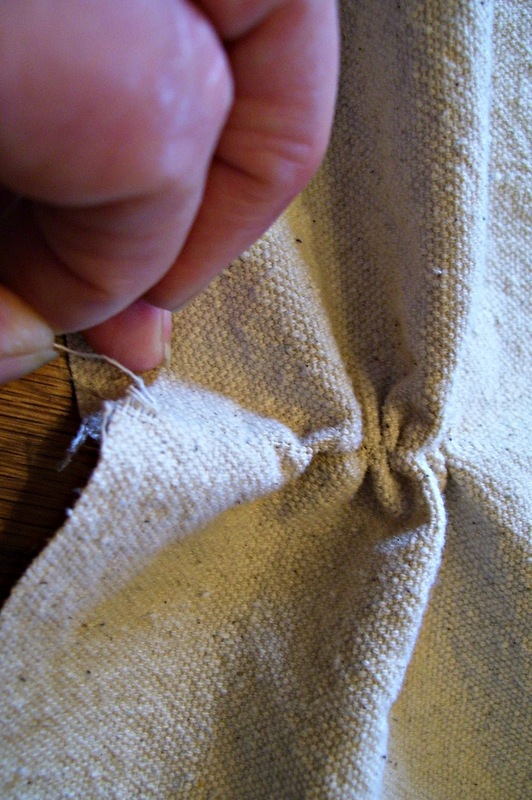 Lisa, the simplest sewing skills can take you a long way in adding touches to your home. If you can thread a machine and sew a straight line, you can make a pillow! Happy sewing! How cute, and what a clever idea. Really adds a nice touch. Thanks for sharing. thanks Maureen for stopping by and leaving that lovely compliment. Love the tablecloth. the ruffle really dolls up the tablecloth. what a change. Wow, you really dressed up the tablecloth with the burlap ruffle. I know you wanted to add length, but you added took the tablecloth to a whole new level - so creative. sharing your always creative projects at Sunday's Best. Brilliant idea! It looks so much better, too! One year ago and you are still sewing up a storm. Thanks for linking up.